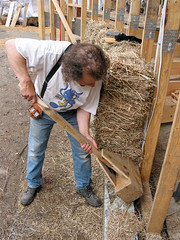 Straw bale wall construction has moved into the limelight in the last decade. The insulation is quite good (though difficult to reach CSS code 6 or PassivhausSee more on the Passivhaus standard. The PassivHaus Institute has pioneered a standard for low energy buildings. It includes very low energy usage and ways of achieving this. The word is derived from the idea of buildings which are fundamentally low energy and passive solar heated rather than using extra gadgets to heat them. See Passivhaus for the UK branch of the organisation. standards without a wall being nearly half a metre thick) and because of the density of the straw, fire resistance[for the purposes of part B of the Approved Documents] - The ability of a component or construction of a building to satisfy, for a stated period of time, some or all of the appropriate criteria specified in the relevant part of BSBritish Standard 476. is good and vermin don’t find it attractive. The embodied energythe total amount of energy it takes to make a material (or a building). See more on embodied energy of the material is extremely low; in fact it may well be carbon negative, depending on other factors such as how far it has travelled, how it was grown and what other materials are used in conjunction with it. It can go up to two stories and is fast to build and the material’s cheap. It can be a very creative process if the internal surfaces are plastered directly rather than studwork and dry lining being used. This is because of the possibility of sculpting and creating curves and features such as niches which is difficult and expensive with normal building methods. A more freehand approach! There is one potential problem with straw bale buildings and that is the risk of water leaks. Water getting into the straw may not show up before the straw becomes sodden and creates very serious problems, virtually becoming a compost heap. There are few houses which at some point or other in their lifetime do not have either a chronic plumbing or gutter leak, possibly going on un-noticed for weeks or months. This of course can also be a problem with other organic insulants. The answer is to have large roof overhangs (always good for protecting the walls, windows and doors from rain), an excellent external rain screenthis is a (usually thin) outer cladding on a wall which prevents rain, snow, etc getting at the structure of the wall behind. see more on rain screen (or high quality rendering which will not crack or craze, excellent rainwater goods, and internal pipework in ducts which cannot transmit water to the straw. 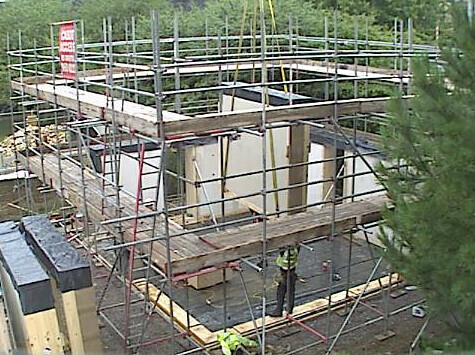 Inserting the bales into large timber frames and then assembling the frames on site using a crane. This is a method pioneered by Modcell. Hemp can also be used as the insulation material. Laying the bales individually, a bit like giant bricks. The technique has a century or so of tradition in parts of the US, particularly Nebraska. Straw is baled at a higher density and pressure than normal and is then laid in a stretcher pattern with thin vertical steel rods running from the timber sole plate to the eaves to bind it together. It can be carved to produce curves and angles. It is then plastered on the inside (or lined with studwork) and either rendered or given a rain screen on the outside. I am planning a strawbale insulated timber-frame bungalow. For the essential plinth I propose to use engineering brick for the outer leaf, and a clay block system for the inner leaf, and the cavity filled with foam-glass aggregate.